Hoo boy. Are you ready for this? In the spirit of NAMING IT, I am going to Name It! when it comes to a popular feel-good movie- Captain Marvel. Hold onto your hats! “Hollywood and the mass media are completely militarized. Look at all the war movies they are doing.” -Chris Hedges, Unspeakable. If Bernie had ever made it to the white house, the generals and arms manufacturers would still have run it. They have completely seized the levers of power. You see the militarization and neoliberal ideology recreated in the Captain Marvel movie, as white lady gets to save the day for alien species, and black people in the movie. Don’t get me wrong. I like seeing strong women. There was a strong female friendship in this movie. It even passed the Bechdel test. However, I noticed in EACH marvel movie that tenderness must be IMMEDIATELY CRUSHED. Tenderness cannot exist under capitalism. Whether it’s Captain America having a crush on a secret agent who then dies, to the aliens in Captain Marvel having a family moment on their ship, where they think they are safe, to the father getting shot in the arm for daring to take a moment to cherish his family. 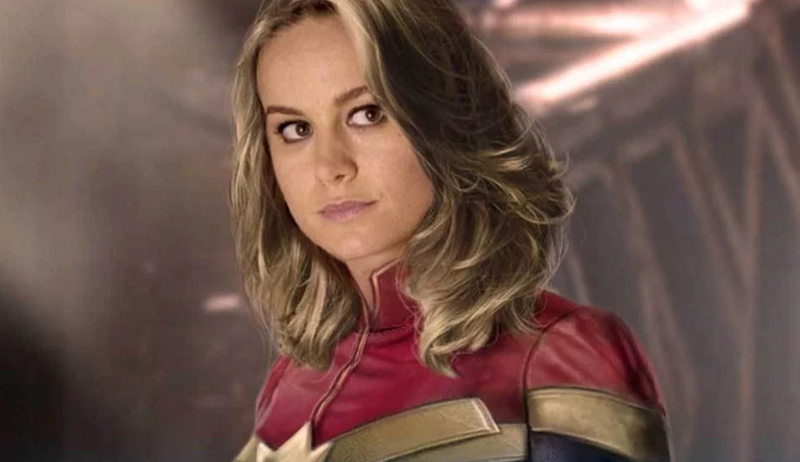 How does Captain Marvel solve this complex problem brought about by white supremacy, and militarization? By punching. A lot. She punches the bad guys. She punches the aliens. She punches her way through AN ENTIRE ENEMY SPACESHIP. There were so many punching scenes that I felt pretty bored. As I usually do with Marvel movies. SO BORED. Can we please not militarize everything? Can we have tenderness? Compassion? Joy? Moments of understanding? Who benefits if I am hypervigilant against attacks that seem to come out of the blue sky? Who profits if I start to fear for my life so much that I look to a mysterious government force to save and protect me? One beyond laws, that can simply act as it pleases to “stop terror”? Chris Hedges writes, “People gradually lose faith in ruling ideologies, in our case neoliberalism. We here on the nonprofit side can see this occurring even faster than those who have corporate or government jobs. When our systems do collapse, as this downturn comes, people will look to us even more to help them get through this time. Hedges continues-“Popular revulsion for the ruling elite is almost universal. It’s a question of which ideas will capture the public’s imagination. Either way the system of neoliberalism is doomed, at least ideologically. If it survives it will be purely through increased stated repression”. Neo-liberalism underlies our nonprofit sector. It’s the paternalistic idea that “white folks know best”. When actually, communities know best what will serve them. Paternalism and neoliberal ideology swept the Oscars this year with Green Book and other movies that portrayed whites as saviors for people of color. As our culture goes, so goes our country. 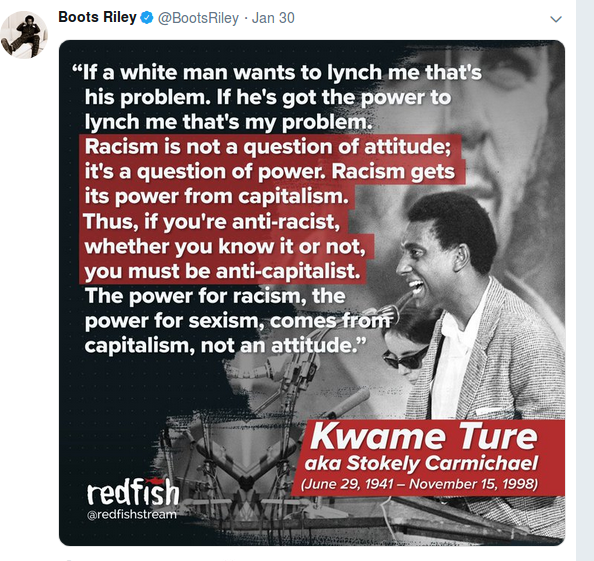 Even if we have more people of color on magazine covers and starring in movies, the underlying ideology of neoliberalism is not being challenged. We still have a lot of work to do. Let’s have some movies that challenge white supremacy, capitalism and the neoliberal ideology and have strong POC protagonists getting the oscar, like, for example, Sorry to Bother You by Boots Riley. If you haven’t seen this movie, rent it now! 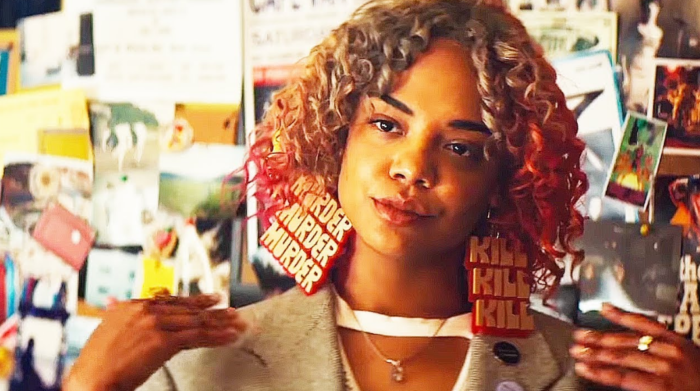 Special shout out to the earrings revealing the subtext of everything! Anyone else want to recommend some movies that challenge neoliberal ideology? Please leave a comment!